"Just about everybody agrees with that, except very stupid people," he said, adding "probably nobody's been tougher to Russia than Donald Trump." Trump claimed. 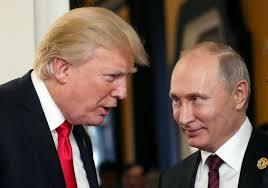 In the series of crisis between White House and Kremlin, the intervention of last US election and diplomatic relation over the expulsion of 60 diplomats and vice versa, Trump defended his praises to Russian President Vladimir Putin that it is necessary to have connections around the globe and to have good relationship with Moscow.